Dr. Xiang Liu, assistant professor in the School of Engineering’s (SOE) Department of Civil and Environmental Engineering and a CAIT-affiliated researcher, is putting his energy and fresh ideas into expanding rail research and curriculum at Rutgers. At the same time, he is helping railroads do business more safely and efficiently. His vision for Rutgers includes developing cutting-edge technological solutions for rail owner-operators, while also providing the well-“trained” talent the industry will need in the near future. According to a 2016 Federal Railroad Administration (FRA) report, the industry is experiencing an “exit wave” as its workforce ages and becomes eligible for retirement. As Rutgers “railroad evangelist,” Liu is recruiting researchers from engineering, management, finance, and planning to form a well-rounded, multidisciplinary rail program and a “rail-centric” academic program for engineering students. Liu has garnered well-deserved recognition for his work and more than $1 million in research contracts. He is the principal investigator on several research projects encompassing topics pertinent to both freight and passenger rail: asset management, big-data analytics, advanced train control operations (e.g., positive train control), risk analysis, cybersecurity, and digital railways. One project Liu is working on aims to determine cost/benefit implications for using positive train control (PTC), even when trains are operating at or below restricted speeds. PTC is a sophisticated, intelligent technology designed to automatically stop a train before it derails or crashes. Currently, regulations don’t require PTC to be activated while a train is traveling under restricted speeds. A 2015 derailment near Mt. Carbon, West Virginia, involved 27 crude oil tank cars that released 378,000 gallons of crude oil near the Kanawha River, the source for two counties’ drinking water. One home was destroyed and one person was treated for smoke inhalation. Photo: U.S. Coast Guard, Chief Petty Officer Angie Vallier. Delving into historical data on train accidents, the research team will identify those that may have been prevented if restricted-speed PTC was being used, analyze the accidents and resulting property damage, casualties, or other consequences to quantify future accident risk. Transporting commodities by rail is about three times more fuel efficient than trucking and much safer. 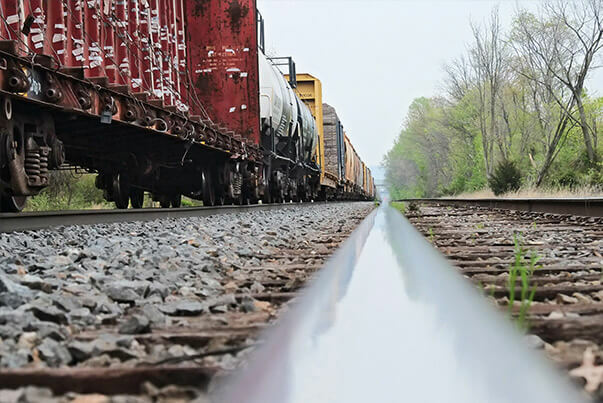 Still, freight railroads are constantly striving to further reduce the number of derailments, especially for trains carrying crude oil or other hazardous materials. A project that CAIT sponsored with UTC funds springboarded Liu’s research to develop a systematic, comprehensive methodology for analyzing risk of derailment and the release of hazardous materials that may result. The research he did on the subject earned him the 2017 Outstanding Research Contribution Award from the Transportation Research Board (TRB) Hazardous Materials Transportation Committee, as well as a Young Member Best Paper Award from the TRB Railroad Operational Safety Committee. In the award-winning paper, Liu presents a practical, data-based probabilistic risk analysis (PRA) model to estimate the in-transit risk for crude oil trains. His methodology incorporated many factors: track quality, train speed, annual traffic density, and population density along the rail line, among other operational and infrastructure considerations. He also factored in characteristics of the train itself: train length; the position of the first car derailed); total number of tank cars; and whether cars are the new safer design. 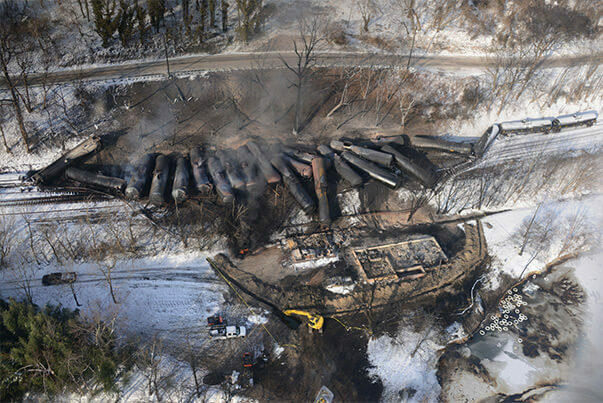 Using these variables, Liu estimated the probabilities of 1) a train derailment, 2) a tank car derailing based on its position in the train’s configuration, 3) for a derailed car releasing its contents, and 4) for estimated consequences of a spill. The final product was a computer-aided decision support tool that automatically calculates risk values for variables like different track types, rolling stock, and operational characteristics. Calculating risk is just one part of railroad safety that Liu is pursuing. Understanding underlying causes of accidents is equally important. Liu found through his earlier research that broken rails have been the leading cause of freight train derailments over the last 10 years. AAR estimates that freight loads will nearly double between now and 2035, which backs up Liu’s confidence that the industry is both viable and sustainable. “Warren Buffett bought the Burlington Northern Santa Fe railroad a few years ago. He doesn’t buy dying companies. And he’s conservative,” Liu says. “Years ago, the question was, ‘How do you keep railroads from dying?’ Now, it’s ‘How do you make them thrive?’” He’s positioning Rutgers to fuel that rejuvenation in the Northeast Corridor. There’s a saying: “I can see the light at the end of the tunnel, but it’s an oncoming train.” Liu turns that colloquialism on its head. In his mind, that light is the bright future for U.S. railroads, heading straight for us and picking up speed. Railroads have invested an average of $28 billion annually for the past three years on infrastructure and equipment.